Wow! Three weeks down, and it feels like minutes! Yes, I know. I'm posting all of these in one day. I've been a little busy, but I promise you, this is the last one this week. This post is the project for today. Err, yesterday. Well, okay it's both. 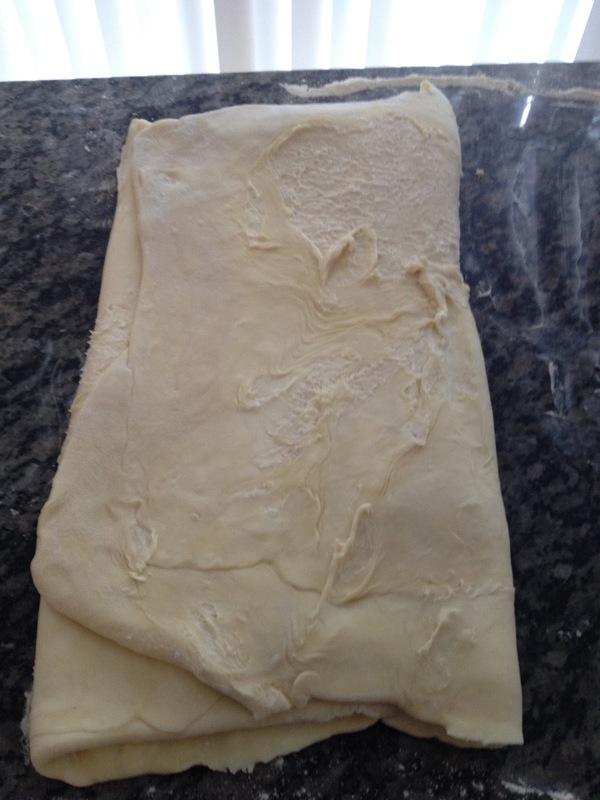 See, the thing about croissant dough... it has to rest overnight under refrigeration. I waited until early evening yesterday (Saturday) to start, so that meant it was far too late by the time I got the dough in to chill. But, that's putting the cart before the horse, I think. Let's start at the beginning! So from here, I start things rolling. In my mixing bowl, I combine all of the dry ingredients, then I add in the milk and butter. When everything is just incorporated together, I take the dough from the bowl and put it onto a lightly floured surface where it sits for 2 hours under plastic wrap while it doubles in size. This dough was incredibly sticky, and I was worried about it sticking to the plastic wrap, so I sprayed a little baking non-stick spray on the plastic wrap before putting it over the dough. Once the two hours were up, I lined a sheet tray with parchment paper and spread the dough out to fit the shape of the tray. Then I very tightly wrapped the entire tray in plastic wrap (at this rate, I should buy stock in Glad!) and put it into the refrigerator over night. 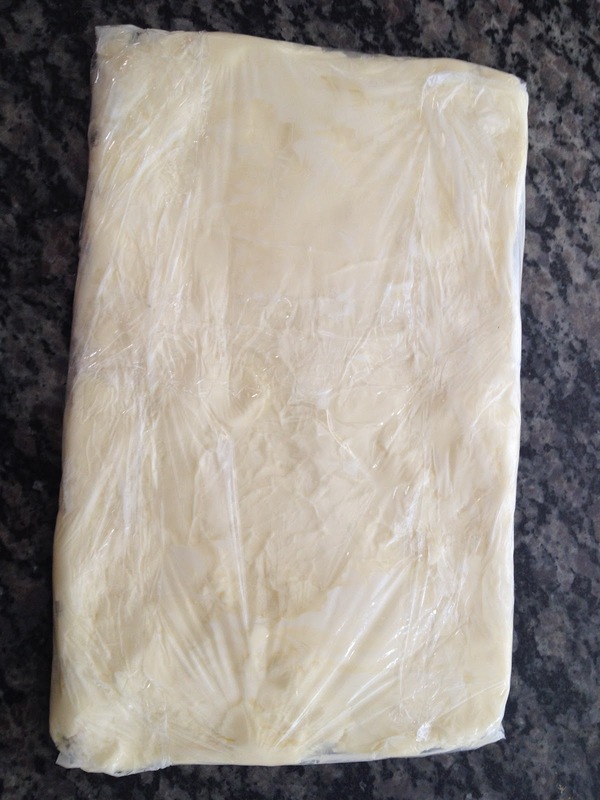 The primary purpose for the butter block is to incorporate the butter in a way that will cause the dough to rise and be all flaky and layered and oh so tasty. How does it work? 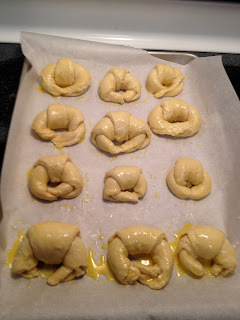 Well, the butter will be worked into the dough through rolling and folding. Little pockets of butter here and there. As they melt, they release steam which causes the dough to puff and rise. The folding method is what creates the layers. Combined these two things create yummy, flaky puffiness! The addition of the yeast is what makes it chewy-flaky rather than crispy-flaky like puff pastry dough. Clear as mud? So, back to the baking. 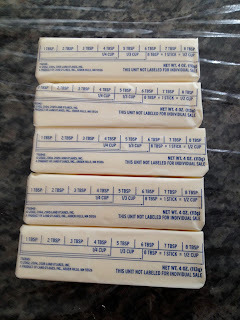 I get out the butter I set aside for the butter block. 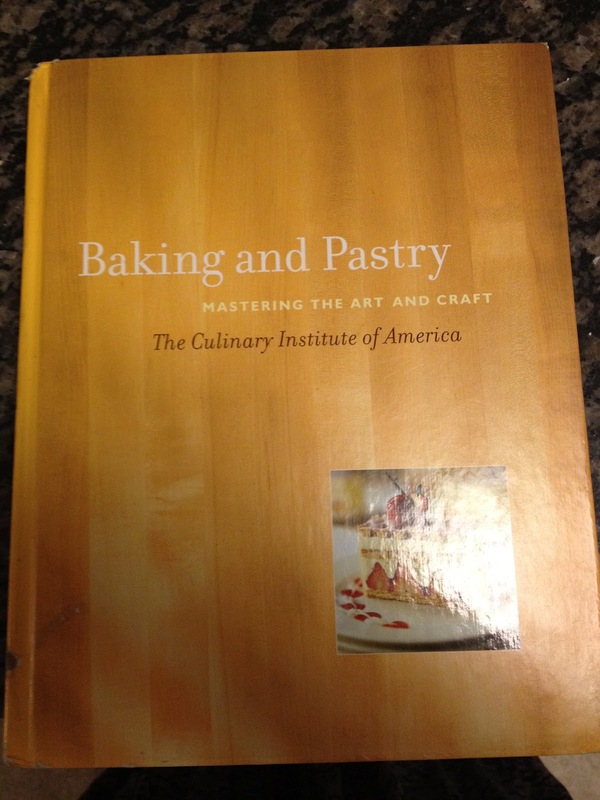 The book told me to pound it with a rolling pin until it became pliable enough to shape into a rectangle. This... did not work for me. *chuckles* I tried. I really did. Eventually, though, I just squeezed the butter in my hands until I could shape it and slowly built the block into a rectangle. Then I wrapped it up in, yep you guessed it, plastic wrap. Into the fridge it went. 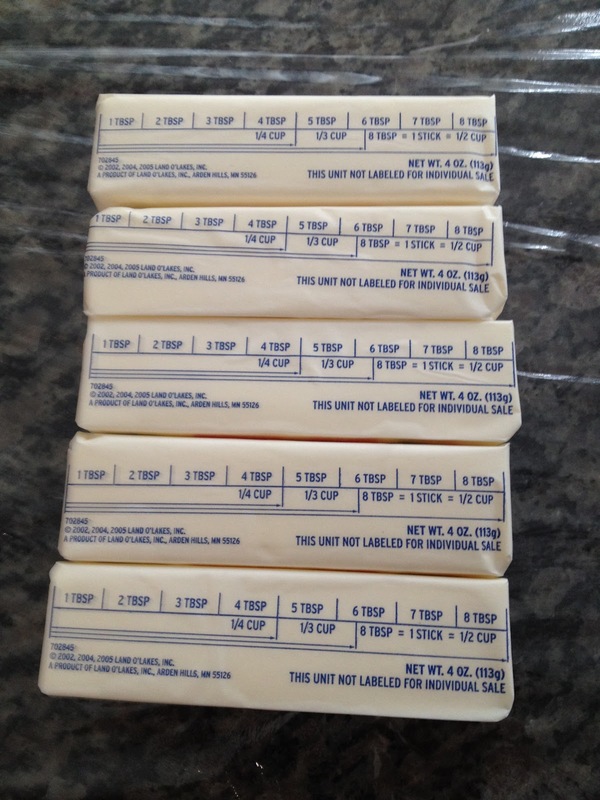 Wow... that's a lot of butter! The time came to pull the two out of the fridge. The counter was lightly floured, and I practiced my not so graceful skills at balancing awkward objects in order to get the dough out of the pan and onto the counter top without blowing flour everywhere. 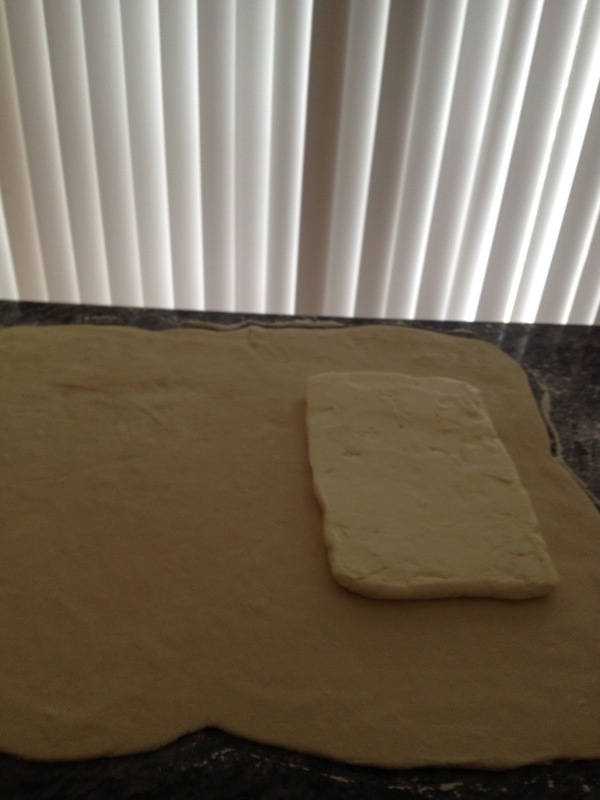 Once the dough was placed, I rolled it out to a slightly thinner, larger rectangle. This gave me space to place the butter block and still seal the dough around it. That's an important factor. You don't want the butter to squeeze out between the seams while you're rolling it out. I may have rolled out the dough a bit too much... or I may have made the butter block a little too thick. It was a bit difficult to work with, but I can't be sure if that's because I've never done this before, or because I did something wrong. A bit of both, I suspect. So, I folded over the top, sealed the edges and then turned it 90 degrees. With the long edge parallel to the edge of my work space, I rolled it out again. The book said 16 x 24 inches, but that's for the full dough. I was going for a roughly 8 x 12 in rectangle. Sometimes I think I rolled it out more than that, sometimes less. Once I reached that benchmark size, though, it was time to fold it. For the first fold, the book had me do a four-fold. What that means is I fold it over four times. The first fold, I take the left side of the dough and fold it past the halfway mark to a point about one third from the right edge. The next fold, I take the right edge and fold it toward the same place I just folded the left edge. Now the edges meet! Yay! 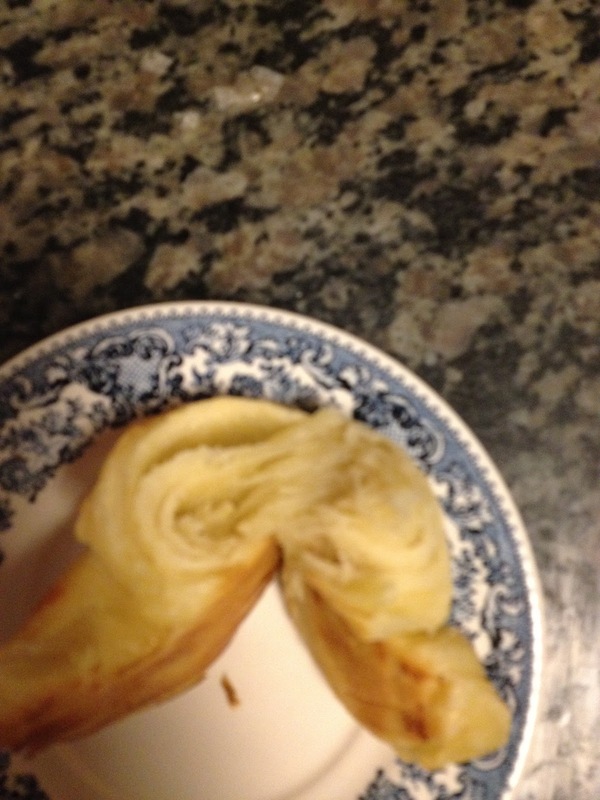 While they're talking and getting to know each other, I take the left side and fold the dough in half. You will notice that it's not an exact fold to and down the middle. When you do fold in the middle on the final fold, part of the first, left fold will be on the same side as the right fold. It's okay; it's supposed to be that way. All of the folds go in the same way, from left to right, and never from top to bottom. There's a reason for this, and it has everything to do with the many many layers you create when you fold and roll the dough. Next, I once again wrap the dough in plastic wrap (seriously, Glad, some stock or a sponsorship would be great!!! *laughs*), and put it in the fridge for 30 minutes. 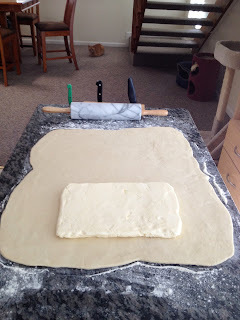 After the timer goes off, I take the dough out, unwrap it, and put it on the counter again--make sure you've lightly floured the surface before hand--placing it 90 degrees from the way it was when you finished the last roll and fold. Keep the long edge of the dough parallel with the edge of the work station, and you should be fine. 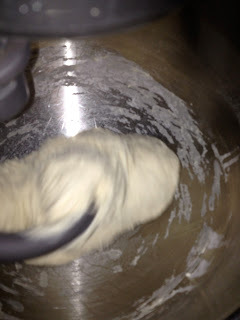 Lightly dust the top of the dough and roll it into a rectangle. Again, I was shooting for that 8 x 12 in mark. This time, instead of a four-fold the book had me do a three-fold. The concept is the same, but slightly different. Take the left edge and fold it over to about 1/3 the way from the right edge of the dough. 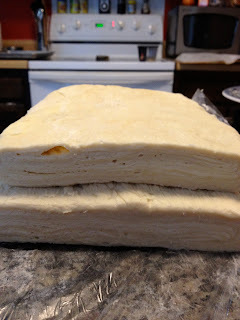 Then take the right edge and fold it over the dough. You're going to have it meed with the fold on the left side. Basically, fold it like you would fold a letter going into a business size envelope. Can you guess the next step? Wrap the dough in plastic wrap (I bet you got it right!) and put it into the fridge for 30 minutes. Take it out and repeat the process just as you did the last time. 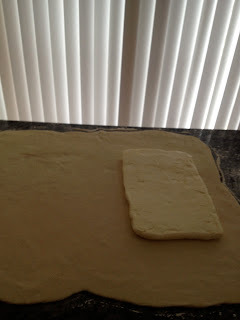 Lightly floured surface, long edge parallel to the counter edge, roll it into 8 x 12 in rectangle, and do a three-fold. 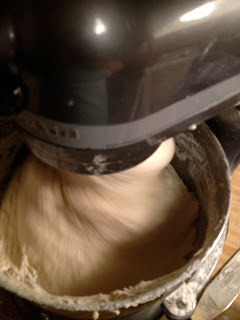 By this point, you'll have folded the dough 4 time, then 3 times, and again 3 times. Lots of layered goodness! Wrap it up again, and chill it for at least 30 minutes. 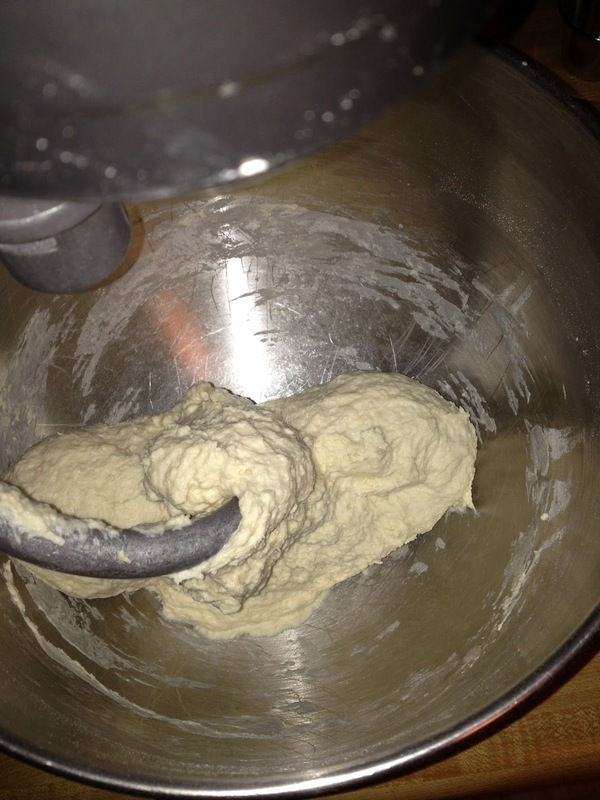 At this point, the dough can be stored up to 2 days in the fridge, or up to 2 months in the freezer. I had some issues with my dough. Technique or instruction can probably fix them, but I was having issues with my butter and dough sticking to the counter as I was rolling it out. It made for a very messy fold in the end. I'm hoping that I salvaged it well, but I won't know until they bake. 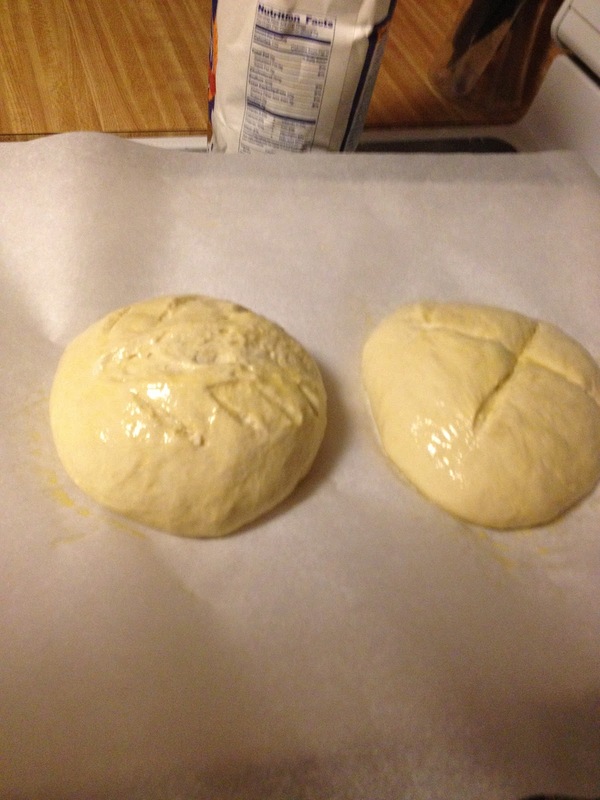 As you can see, not the neatest of doughs. I let mine chill for a while, at least one hour, but it might have been a little longer. Then I pulled it out, cut off a portion and weighed it. 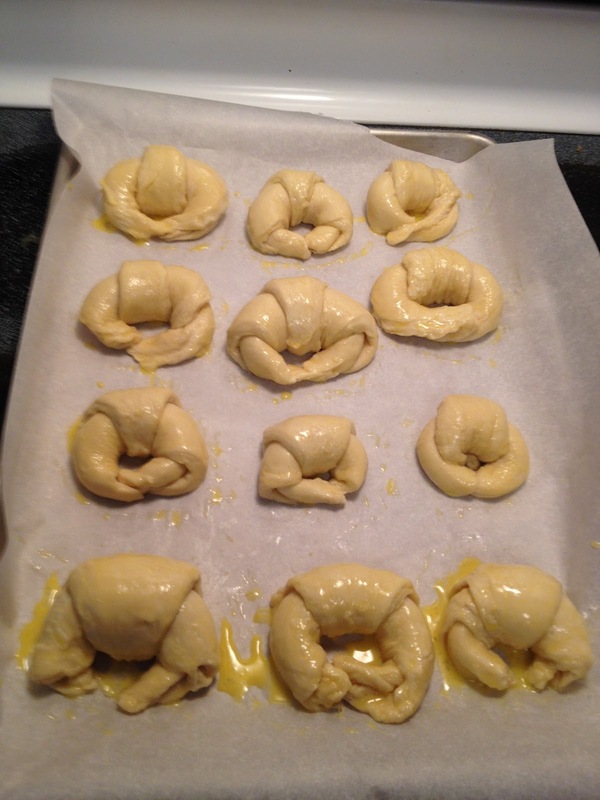 The recipe for 12 croissant rolls calls for 2 lb 4 oz of dough. So I took my scale, put a plate on it, and zeroed it out. Then I took a very sharp knife and cut off a little more than 1/3 of the dough I had there. When I lifted that section away, I was in awe of what I saw. For just a moment, I was totally stoked with myself. One way you can tell if you've done anything even remotely right with a dough like this is seeing the cross section. If you can see the layers, you know you've done well. 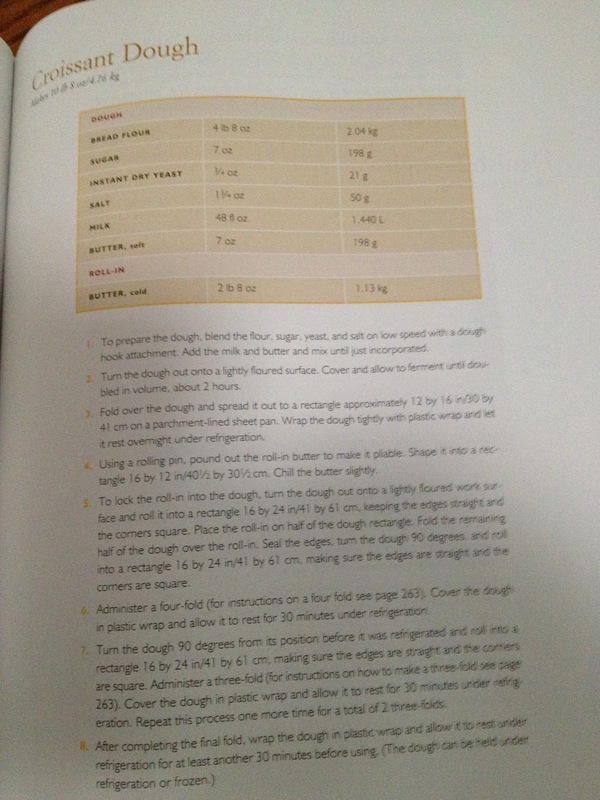 When I looked at the cross section of my dough, the layered sections looked just like the picture in my book. I didn't squeal like I did last weekend, but I did cheer a little and smile pretty wide. I was home alone, and sadly the cats just don't appreciate my success. Hopefully you guys will! Here's what it looked like. All of those layers, even if they aren't perfectly executed, mean that I did partially get it right. With time and practice, I bet I could get better at it. From here, I re-wrapped the portion I wasn't going to use right away, and put it back in the fridge. Then, again on a lightly floured surface, I rolled out the dough I weighed for this recipe into a rectangle that was roughly 9 x 24 in. Then I cut a line straight down the middle, parallel to the edge of my counter. Going from top to bottom, I made two more cuts, dividing the dough into three sections. Now I have 6 small squares (okay, they were really more like rectangles, but whatever). 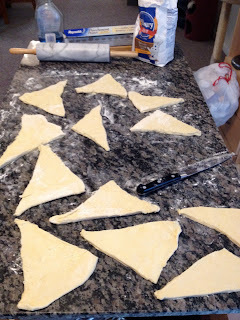 Those I cut from corner to corner, making 12 triangles. I took each triangle and gently stretched them, taking care not to tear them. With my knife, I cut a small notch, about 3/4in, in the base of the triangle. Then I rolled them from the base to the tip of the triangles using gentle but steady pressure with my fingertips. I placed them on a parchment lined sheet tray and curved the ends in toward each other. 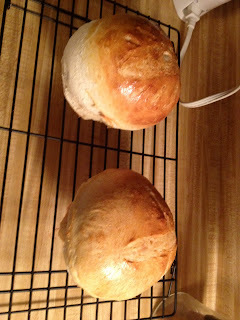 Last, I brushed them with egg wash and let them sit for an hour to rise. After 1 hour, or once they've doubled in size, I brushed them with egg wash again, and put them into an oven preheated to 375 degrees. The book says bake for 15 minutes or until nicely browned. My oven is weird. After 25 minutes, I finally took them out. Well, if I'm honest, I didn't taste anything at first. Not really. Then there was a hint of butter. Then I put it down for a minute or two and pulled the layers apart, just to see how easy it would be. They almost melted apart. When I put one in my mouth, it nearly melted and tasted so good. 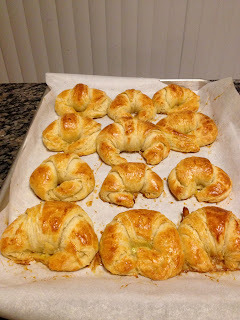 So the lesson I learned for myself is that croissants are like Starbucks: you have to let them cool a few minutes before you can actually taste them. The real test will come in a few hours when my fiance gets home and has one. I'll let you know what he has to say. He came home, and he tried them. And by tried I mean he had 3 in the hour between him coming home and my walking out the door for work. His verdict? He said they had good flavor, but were a little dense. We discussed a few things, and I've come to the conclusion that I think it's because I didn't proof them properly. Meaning that the hour they're supposed to sit between the first and second egg wash, just before baking, I wasn't able to control the temperature, and they hadn't risen anywhere near enough by the time I put them in the oven. So in addition to all of the wonderful and yummy treats I'm going to make, we're looking at getting or making our own proofing cabinet. May I just say that this is one of the millions of infinite (don't judge my inability to do or use math terms properly) reasons I love this man? No? Oh, well tough, I just did. Seriously, he supports this blog so that I can work toward my dream. And on top of that, it was his idea to make a proofing cabinet so that I can learn properly! I have plenty of croissant dough left. If I feel up to it tomorrow (Tuesday, since this Update is happening on Monday, the day after the post was originally made), I might try the chocolate filled ones, but use spreadable Nutella rather than chocolate batons. MMmmmmmm.... Also, his idea. Seriously love that man! Return of the Blob...errr, Lean White Wheat Bread, take 2! So here we are, the following week (shhh! Stop looking at the date and realizing that it's only minutes after I posted the last one! Suspend your disbelief and pretend I posted these entries within a day or two of them actually occurring... k? Okay! ), and I've done the math. Yes, the dreaded, horrible, awful, no good, very bad math! Well, yes, that is a bit melodramatic, but it was fun. And I hate math. I'm really not good at it, even with a calculator. But sometimes it's necessary. For example, when I'm trying to figure out how much of my ingredients to use when cutting down (or doubling, as the case may be) a recipe. 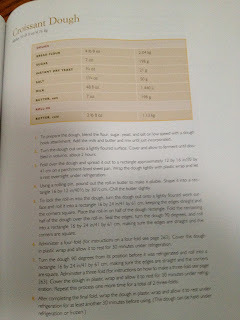 Last week, I tried to make the bread dough straight out of the book, and it failed utterly and miserably. Today I've cut it down to 2 possibilities: 1/2 the size, or 1/4 the size. I ended up going with 1/4, broke out the food scale and got to work. Right away, I was cautiously optimistic. 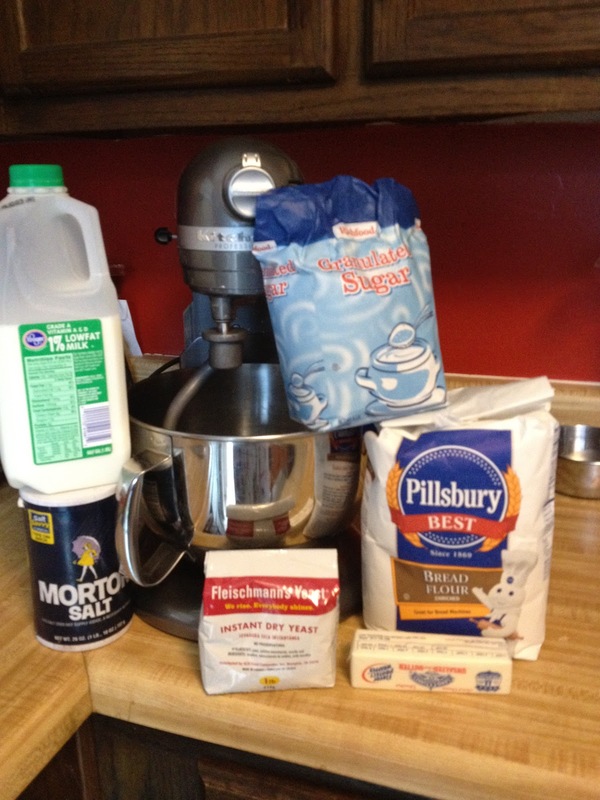 No weird noises came from my mixer, and the ingredients seemed a bit more harmonious this time. After just a couple of minutes, I squealed with delight and jumped up and down, giggling. That image is probably made funnier when you realize that my fiance and I had 4 of our friends over for an impromptu night of board games. Here's why I squealed. To the left, the mixer is still on. To the right, the mixer has been turned off. In both, I managed to get the dough to the clean up stage! I really was very excited by this. After last week's complete and utter failure, just making it beyond where I gave up was a huge coup for me. So I followed the rest of the directions, let the dough rest on a lightly floured surface until it was about double in size. Then I very gently folded it over a few times. This part confused me, because I'm used to the aggressive kneading that has to be done for like 10 minutes without stopping in order to get the right level of elasticity and all that. 1. Cut the dough into two equivalent sections. 2. Gently stretch to get an oblong rather than roundish piece. 3. Place long edge parallel to counter's edge. 4. Pull the ends around toward each other and have them meet as close to midway as possible. 5. Turn the "ball" so that the end seam is toward the counter. 6. Cup hands around "ball" and move in a wide circle over counter's surface. 7. 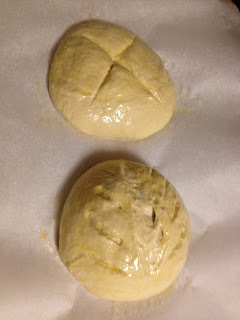 When skin on dough is tight, smooth and even, put on parchment lined tray. 8. Repeat for all balls of dough until you've done them all. This is what they looked like after I threw in a little funky scoring. The top is obviously an X, but the bottom looks... weird. It's supposed to be a stylistic tree, but the center spread so far that it didn't hold shape. No worries. :) I was just happy to get to this point. Next up, the baking. There wasn't a recipe to just bake this dough as it was. All the other recipes incorporated this dough into something else. So I took the average of their bake times (between 25-30 minutes) and set my timer for 25 minutes. 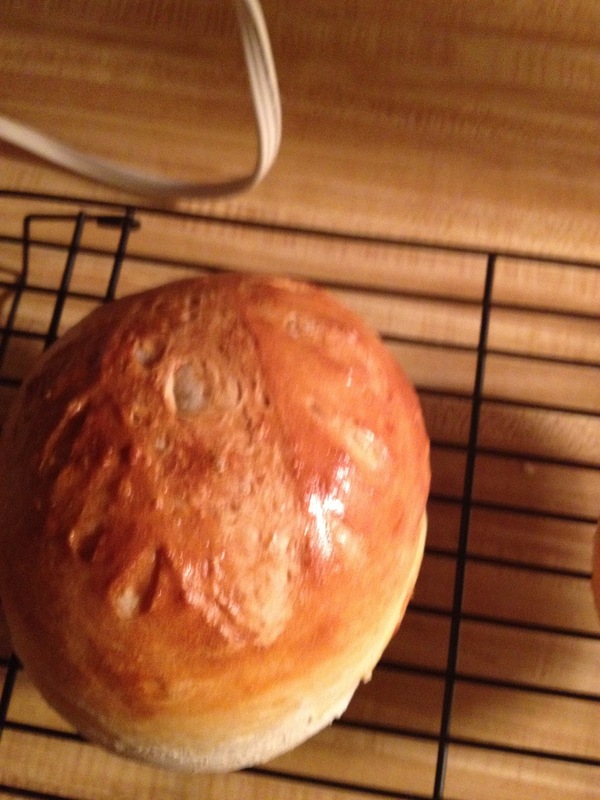 My fiance and my friends very quickly started to comment on how wonderful the bread smelled as it baked. They all seemed very excited to try it. It took a little longer before I would let myself get excited, but eventually I did. The timer went off, and I managed to not run the 5 feet from the table to the oven. I'm really not sure how, but I managed it all the same. When I opened the oven door, I got something I didn't expect. The bread turned out beautifully. yes, I realize this picture is sideways, but I think it still looks gorgeous. It had to cool for a few minutes on a wire rack before it was able to be cut into. At least, that's what the book said, so that's what I did. The first piece fell away and steam rose from inside the bread. It was a glorious moment, but nothing was quite so glorious as that first bite. Soft and chewy, crust that was just hard enough to crackle, but not so hard that it hurts your mouth... I was in heaven. 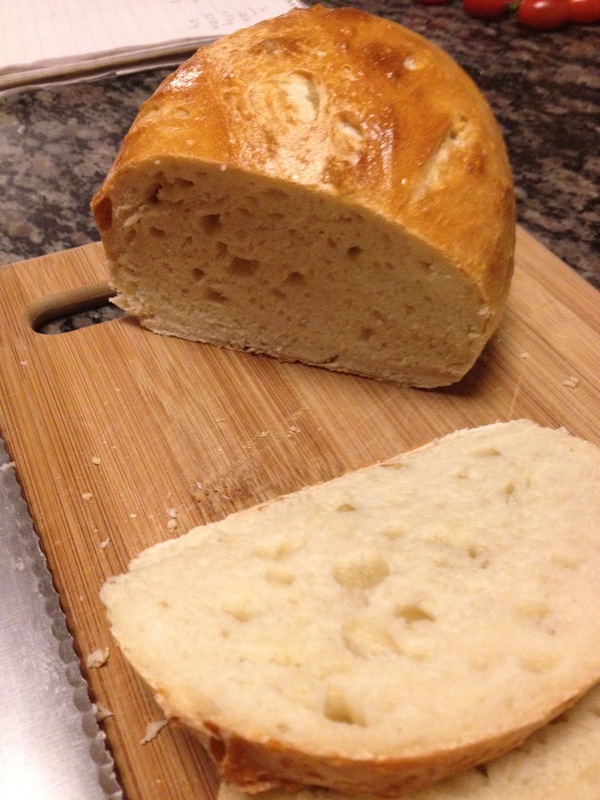 The bread was a bit denser than I expected, but not detrimentally so. As for what my friends thought of it? Well most of them each had two pieces, and both rounds were gone by the time they left. I'm guessing they enjoyed it. All in all, I'm really glad that I tried it again. It gave me a bit more confidence, especially when it comes to trying harder recipes, and interpreting things that I'm not used to seeing. Things for which there isn't a clear explanation in the book. There's an index and a glossary, but I'm starting to understand that this book was really meant to be used in conjunction with a teacher. I am not daunted, though. I will learn! And some day, someday that mouse will get his cookie. 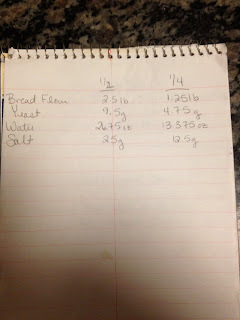 then I got out my ingredients--5 pounds (lbs) bread flour, 2/3 ounce (oz) instant dry yeast (NOT the same as Active or Rapid Rise), 53 1/2 fluid ounces (fl oz) water, and 1 3/4 oz salt--and I got started. 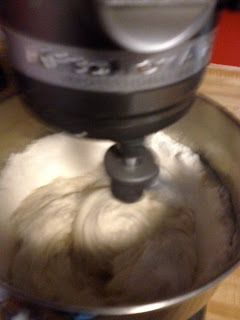 First I put the flour and the salt into my mixing bowl with the bread hook attachment and turned it on speed 2. 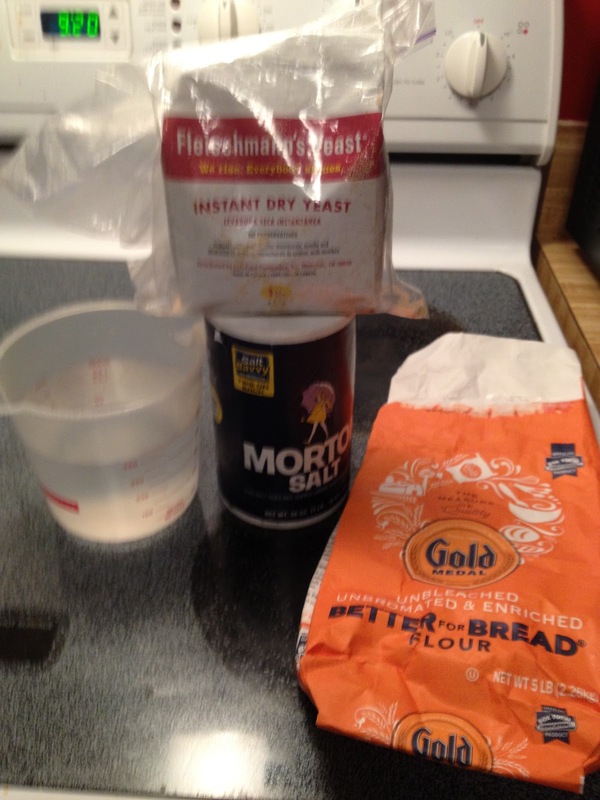 After a few seconds, I guessed that the salt was mixed in and added the yeast, and lastly I added the water. I turned the mixer back on to speed 2 and watched, prepared to be amazed at my own skill. 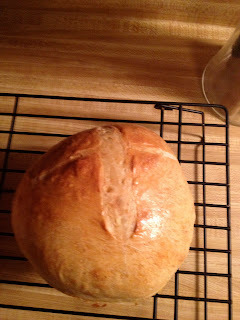 You might have noticed that the recipe called for 5 pounds of bread flour. Not cups, not tablespoons. POUNDS. That's an entire bag, ladies and gentlemen. I'm here to tell you that anything short of an industrial size stand mixer or a VERY determined and strong person will not work. 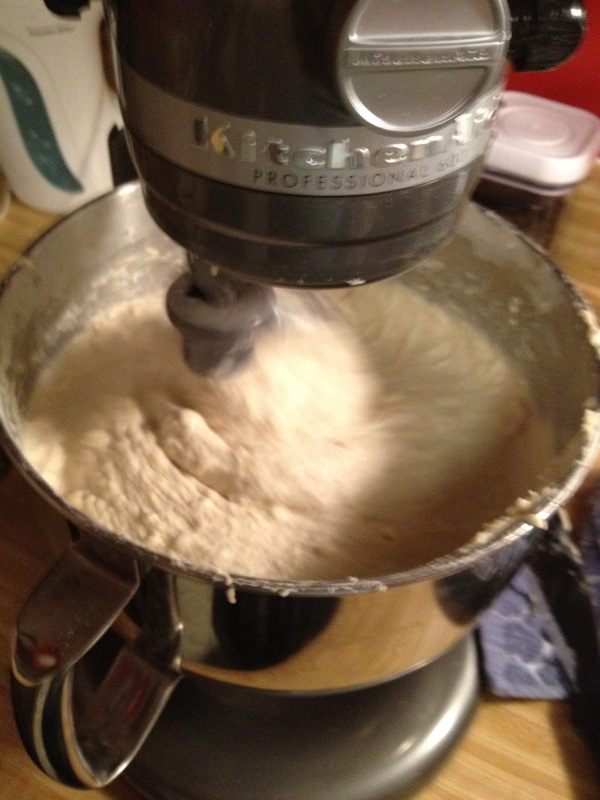 I have a Kitchen Aid Pro600 series mixer. Rather soupy, no? That's okay. The first step is supposed to look like this. Once the flour becomes incorporated, the appearance and consistency changes. So I watched, I cleaned, I did a few other things, though I don't remember what, because mostly I hovered and worried. It kept looking like this. I stopped the mixer from time to time and used my flat icing spatula to lift the dough and scrape the bottom. The first few times I did this, I noticed a tiny change in the consistency of the dough, but eventually there was nothing left to scrape. The flour was incorporated. So... I decided to take a piece of advice from other bread recipes (*coughs*bread machine recipes*coughs*) I've used before. 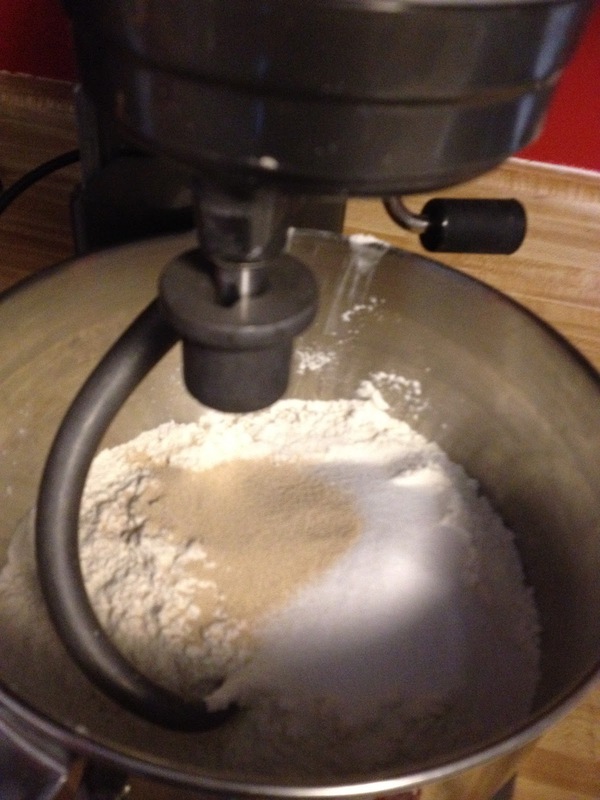 I added more flour, 1 tablespoon at a time. 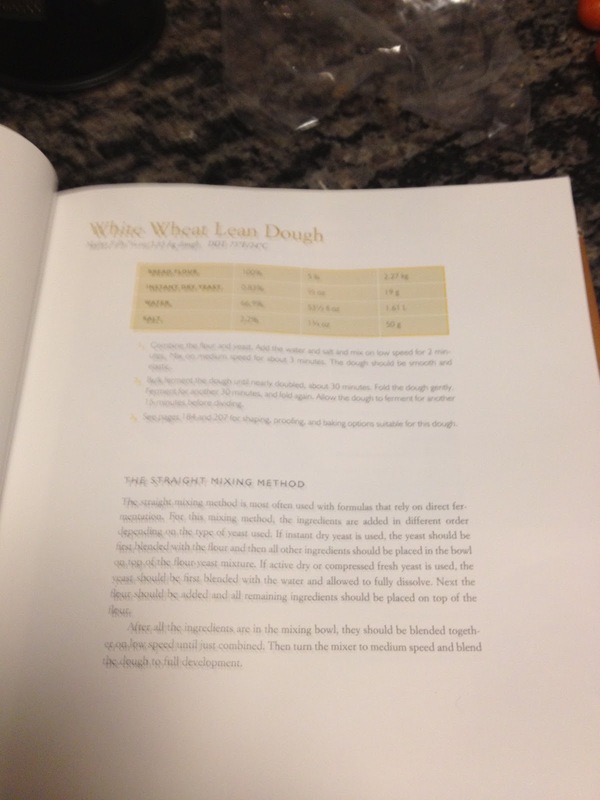 This got me really excited, because after each tablespoon, the appearance of the dough changed. After half a cup (8 tbsp), the consistency started to change as well. I was still scraping the bottom and sides, hoping against hope that I'd make this work. Alas, it was not to be so. After an hour of mixing and adding no less than another cup of flour (possibly more; somewhere along the line I stopped counting), the dough still hadn't reached the clean up stage. 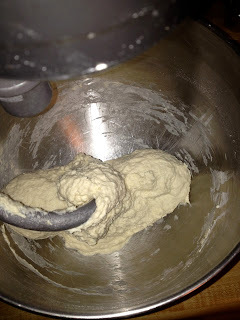 Basically, it's stage 2, in which the dough incorporates the flour into it and cleans the sides of the bowl of any remaining ingredients as it mixes. By this time, the gluten was starting to break down and the dough was climbing the hook. I was starting to worry that it was going to get into things it shouldn't like some sort of '50's B horror movie villain. My fiance came in and took a look. We both agreed that it was time to stop, clean up and try again next week. That's our plan, after all. If we don't get one recipe to work the first time, we keep trying until we do. So Day One of teaching myself to bake didn't yield an edible result, but it did teach me something: I'm not super girl, and my mixer is not invincible. There were noises coming from that poor thing that made me wince and quickly slap the power level to OFF. When we finally cleaned up, I put my hand on the top of the mixer and it was hot. The poor dear worked extra hard that day. So next week, the recipe will be cut down and I'll try again. Okay, okay, just kidding. Sort of. This blog has a great deal of promise and potential for me. I've dreamed of owning my own bakery for so many years now, I can practically taste it. No, no wait. That's the chocolate chip cookie I just ate. And let me tell you, it tastes soooo much better than plaster dust and paint! Where was I? Oh right. Dreams and such. It hasn't been feasible for me to open a bakery. I don't have a formal education. What I do have is drive, desire, and a few professional text books. Every now and then I decide to open one and make something out of it. It turns out great, I bask in the pride of a job well done, and start thinking about how I want to serve it in my imaginary (also known as someday in the future I will have it) bakery. Then I realize that it was just one item out of how many I'll need to know to succeed? I can't possibly teach myself everything, can I? What I need to do is go to school. This leads to a search of culinary programs in and around my area. There are many, but none of them have a robust baking and pastry arts program. On top of that, only one has a mediocre program, and it costs far more than I'm willing to pay for the level of education I'd be getting. There is a program I want to go through. It's a year long program at L'Academie de Cuisine in Maryland, but it's a fantastic program, and the school is ranked in the top ten of the Nation. I have a way to pay for it, but this current moment in my life isn't conducive to my attending. So I made a decision. Well, my fiance made a fantastic suggestion and has been wonderful about helping me stick to it. We picked one day out of the week (for now it's Saturdays, but in the future the date will change as my work schedule changes), and I pick a recipe from one of my text books. The guidelines are it has to be something I have never made before so that I am learning something new. In theory we're starting at the beginning and working our way through to the end. In reality, I'll be mostly working from front to back, and jumping around a bit in the middle. We figure, after a few years of working and saving money plus diligently teaching me to bake through semi-professional guides, I just might be able to give a mouse a cookie... oh yeah, and open a successful bakery.